and - woosh, where did this year go? We may like miniature things but don't the years seem to be getting more and more mini! Well busy busy as ever and been making new things and experimenting. Here is a small collection of what I have been playing with. and at last Fairbanks has been brought in from the cold. She now sits in my 'hobby' room waiting for final decoration. 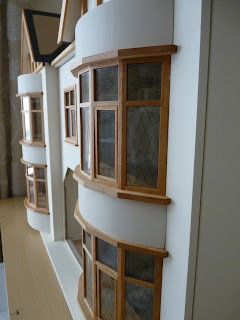 Since moving her into the house I have made 'leaded' windows for her and will put the doors in later today - which have also been painted and stained glass patterns added to their window part. no 'leaded' windows added to this side yet. i love the way you've decorated the rooms! Beautiful. You have some lovely things available. I feel some shopping coming on and I'm looking forward to progress with your Fairbanks. Hi :) I have just found your lovely blog. Your house is gorgeous. I hope to see more soon. Hi! I would love to know if this Fairbanks you have completely finished and furnished. Could you see progress? Hi Blanche, sorry but I no longer have Fairbanks I gave it away before moving back to UK as we were down sizing and I had to find new homes for Fairbanks, Pembroke Grange and Queen Anne - all now with new owners.